Congratulations! You win 21 bonus points with this purchase! These eye drops certainly work and they don't sting like other products. I use them occasionally when required. I was recommended to use these drops by my optician to cure sore eyes apparently caused by dryness. Have been using the drops for more than a week without much improvement as yet but I will keep using and hope for the best. good service each time I place an order, but they say letter box friendly but the boxes are too big, a lot bigger than needed. I use these eye drops along with my contact lens as I have very dry eyes, it helps to get the lens to stick to my eyes, also I can keep the lens in all day and into the evening. I would definitely recommend to anyone with dry eyes. For dry eyes and blepharitis. Morning and evening. plus during the day if necessary. Lasts 3 months unlike other eye drops, so good value. The product helps to lessen my dry eyes symptoms. The seem to work, prescribed by my optician for Blepharitis. Natural product with no preservative. Perhaps not quite as good as gel for really dry eyes but can be used in combination. The product was recommended by my eye surgeon, a leading specialist in his field. It has helped enormously with my dry eyes. I have Sjogrens Syndrome and my eyes are always sore and dry. My optician recommended these drops and they're fantastic. Very good product and convenient bottle, release drops into your eye very smoothly. I've found these the best eye drops to use for my dry, gritty eyes. Excellent product recommended by my optician. These eye drops are the best and the savings were great! I use this product daily. I suffer from blephritis. I was prescribed these from my local dry eye clinic and told to use them daily and they can be used even when I'm wearing my contacts. These drops are half the price that my dry eye clinic sell them for! Ever so soothing and medicinal. These moisturising and lubricating eye drops for sensitive eyes provide immediate comfort that lasts all day. Hyabak Protector drops contain the active ingredient hyaluronic acid also known as hyaluronan and are free from preservatives. Dear Fabrizo i was advised to put one drop in each eyes by the Doctor. As I have to squeeze the bottle hard to let the liquid out, many a times i end up putting more than one drop. (may be two or three- I can feel- i do it myself) is there any issue if I put more than one/ two drop? You should not run any serious risk, but try to do your best to apply one drop. I have reported the issue, but please contact me at info@lentiamo.co.uk, if you have any more querys about the subject. It is possible that the hole is smaller than usual. Please try to press it harder, if no luck contact me at info@lentiamo.co.uk and we'll try to solve the problem. On the leaflet, there is nothing mentioned about pregnancy. For any medication you want to take in this period, please contact your doctor before. Started using these drops occasionallt They are very good but qhen i blow my nose it bleeds. Is this a known side effect. What else can i use without this effect. For this issue and for a recommendation, please contact your optician. If the problem is serious and bothers you, please stop using them asap. How do I open the drops? Do I need to use a needle?! Very odd! In theory there should be a tiny, invisible hole in the tip, so try by squeezing with a bit of force, the first time. Hi, Please could you tell me if I can use 2 drops in each eye? Or would you reccomended just one drop in each eye. Great product by the way!! You can apply two drops as long s you wait 10 minutes between the first and the second. If you get in touch with me at info@lentiamo.co.uk I will send you the instruction leaflet. 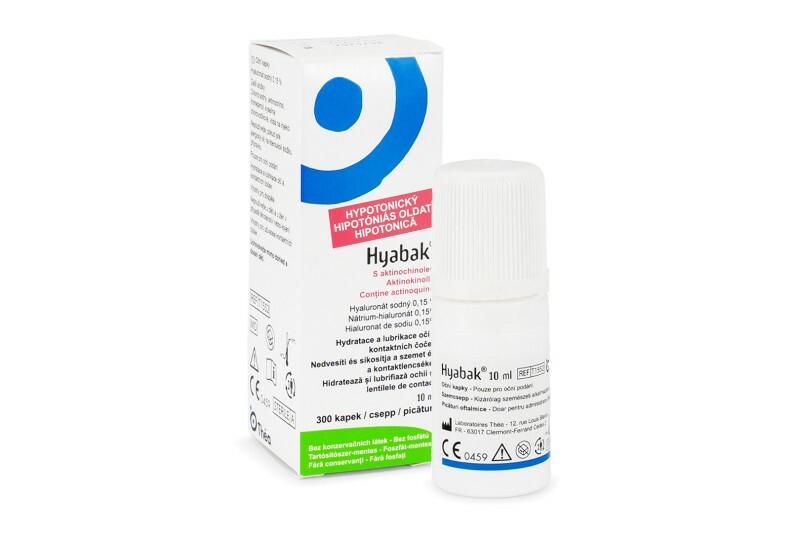 Are evolve ha 0.2% eye drops the same as hyabak 0.15%. My pharmacist gave me evolve instead of the hyabak!! Help!! Dear Tricia. Thank you so much for your message. How I can help you? Have a nice day. I have the same problem with Jamario. I unscrewed the cap but also no drops. May I ask you for further information regarding the issue you have with the eye drops? It doesn't seem very clear from the comment you left. Yes when i use the drops at night or during day its fine. However rhe next day each time i blow my nose it bleeds. When i stop using drops this does not happen. Has also happened with other drops called xalin. how do you store hyabak drops once opened? Hi im asking for second opinion about Hyabak 0.15% because i am going to use this for my daughter's eye. Age 1years old. She has an eye discomport/irritation and an Pediatric Ophthalmology recommend this medicine. My bottle says it expires in September, 2018. Why is it not good three monhs after opening? Do you have an order number so I can check out what bottle we have sent you? The manufacturer's re­commendation is that the product has to be used up to three months after opening. How do u open a bottle of hyabak? Having a hard time. A bottle of Hyabak has to be opened the same way as you usually open every other bottle of eyedrops. Only unscrewing the cap should work. My bottle seems to be sealed. I unscrewed the cap, but no drops come down. I have done undergo kera ring procedure for my keratuconus and my doctor prescribe this hyabak. What Are the benefits of this in my condition? my question is this. is hyabak 15% and naabak is the same. i use naabak and my mother have two hyabak. i want to use the other one of hyabak of my mother. Hi, Naabak and Hyabak are not the same eye drops. Hyabak is not as strong and doesn't contain any preservatives as Naabak. Thank you! it's the first time I am using these drops. a) How long do they last before they expire? b) Do they need to be kept in the fridge or a certain temperature? You have the information leaflet in English on your account on our page and attached to the despatch email. Your answers: a)Do not keep an open bottle for more than 3 months. I hope my reply helped! How long do you have to use them bev your dry eyes improve, I've bev using them every hour for two weeks now, thankyou. oh no - I'll have to go elsewhere to purchase for the UK delivery - I love these eye drops - they are the only ones I've found that actually work for me. :( Yes, it is a pity that the producer does not allow us to sell it to the UK anymore. They are, indeed, very efficient. I am afraid we are not allowed to provide Hyabak to our UK clients anymore. Otherwise, it would have been my pleasure to send it to you.